Hold off on that thousand-dollar plane ticket to Greece. Or Morocco. Or Italy. We’ve found nine Miami restaurants guaranteed to make you feel like you’ve teleported to the Mediterranean—waterfront views, mega yachts, chilled wine, fresh seafood and all. Daniel Boulud’s Boulud Sud is worth a visit anytime—especially when you’re in the mood for something light, spiced and delicious, like his famous chicken tagine served with couscous and cherry tomato confit. Don’t miss out on the spicy Moroccan hummus and the warm basket of madeleines, either. Want to eat super-authentic fare in a bustling little brasserie, just like on the coast of France? Head to La Petite Maison. A little champers and a warm dish of crème brûlée will go a long way here. 1300 Brickell Bay Dr.; 305-403-9133 or lpmlondon.co.uk/miami? As one of Miami’s finest and longest-running Mediterranean seafood restaurants, Milos is never a bad idea. With locations around the world (Athens, Montreal, London), we’re partial to our hometown outpost for a few reasons: It’s basically located on the beach, the dining room is equal parts traditional and modern, and the food is always top-notch. Pick your favorite fish and have it fried, grilled or served as a tartare, paired with a classic Greek salad and a side of fried potatoes. As far as we’re concerned, it doesn’t get much better than dining on a grilled shrimp salad while lounging on Seaspice’s gorgeous patio on the Miami River. You’ll also have a prime viewing spot of mega yachts cruising along the downtown waterfront. Yep, Miami luxury at its peak. There are many reasons why we love Deck Sixteen. The restaurant serves the best grilled halloumi cheese we’ve ever tasted, topped with za’atar-spiced pistachios and a strawberry Champagne vinaigrette. The rooftop location makes for a pretty epic sunset. Oh, and next door you’ll find Miami Beach’s one and only rooftop dog park. Just call this place heaven. In the mood for Middle Eastern fried chicken, hand-rolled couscous and seared cauliflower? At Byblos, the freshly prepared dishes are served family-style. Not to mention, the restaurant itself is absolutely stunning. (Still wondering why our apartment doesn’t look like this…) So yeah, rally a group of besties for a leisurely evening of Mediterranean eats and a pitcher of spiked Greek punch. Make your way to the second floor of La Centrale, Miami’s largest Italian food hall, for a meal at Pesce. The charming whitewashed eatery evokes the feel of a coastal Italian restaurant,slinging fresh South Florida seafood and crisp white wine. Don’t mind us as we nibble on a half dozen oysters, a glass of prosecco and gnocchi with clams and pesto. We’ll rarely say no to a visit to the ritzy St. Regis in Bal Harbour—especially when said visit involves some of the most authentic Greek cuisine in all of Miami. 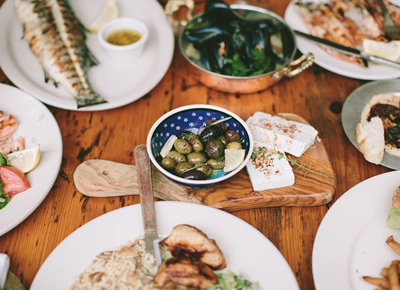 The restaurant sources itsseafood from local waters and a Greek fish market in Athens so you can have the best of both worlds. That’s why we’re going all out with orders of the Champagne salt crusted branzino and the lobster linguine.